Tatiana Bilbao ESTUDIO analyzes urban and social issues to rethink how spaces can be “reactive to global capitalism, opening up niches for cultural and economic development.” Bilbao founded the multidisciplinary practice in 2004 in Mexico City. At the 2015 Chicago Architecture Biennial, Bilbao presented a full-scale affordable home prototype intended to be constructed in Mexico for anywhere between $8,000 and $14,000. Its design was developed based on her extended interviews, workshops, and qualitative research conducted with prospective Mexican tenants. The investigation resulted in a modular home made from a concrete core and brise-soliels made from reclaimed wood palettes that can be re-positioned to adapt to geographic, social, and budgetary constraints. Using similar investigative strategies, the firm has designed affordable housing complexes in Ciudad Acuña and Chiapas, both in Mexico. Other recent projects include a mixed-use building for the University of Monterrey; the Adrastus Collection Museum in Arévalo, Spain; and an open-air chapel for Ruta del Pelegrino, said to be the most traveled pilgrimage route in Mexico. 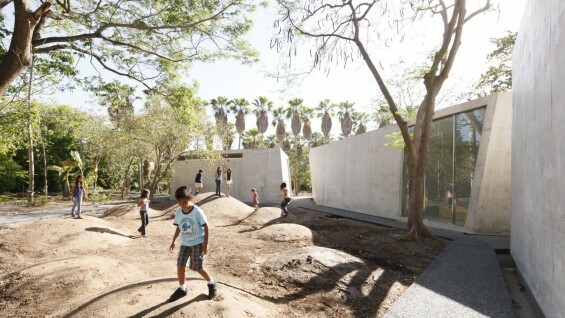 The firm also designed Culiacán Botanical Garden in Sinaloa, Mexico, which features 35 different works from international contemporary artists. Tatiana Bilbao graduated from Universidad Iberoamericana in 1996 and currently teaches at Yale School of Architecture as the Norman R. Foster Visiting Professor. In 2016, she was shortlisted for Architectural Review’s Woman Architect of the Year Award. Architectural Record awarded the firm the 2007 Design Vanguard Award and in 2014, it received the Global Award for Sustainable Architecture from the LOCUS Foundation. Bilbao was named one of The Architectural League’s 2010 Emerging Voices.